Need to remove an unwanted pinstripe or graphic? The soft, resilient material of the Stripe Eliminator wheel acts like an eraser, stripping away pinstripe tape, decals, emblems and adhesives - leaving vehicle finishes like new with little to no residue or cleanup*. 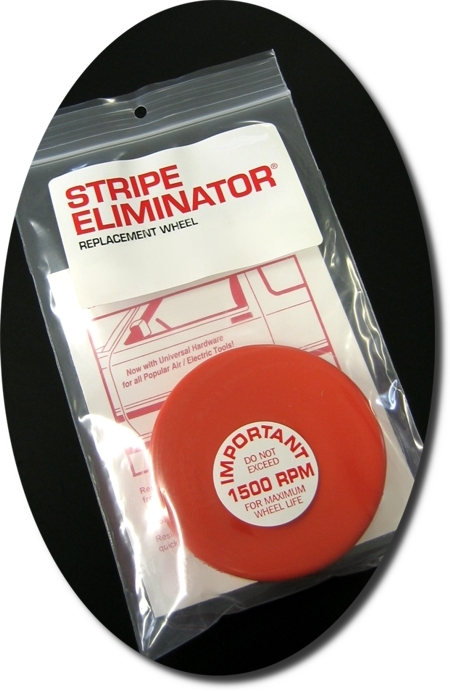 Stripe Eliminator can be used on most popular air and electric tools, from low speed (1,000 RPM) battery powered tools to high speed (4,000 RPM) air tools, and features heat absorbing qualities that leave the vehicle surface clean and cool. Quickly and cleanly removes pinstripes and adhesives. Works great on old, checked and cracked pinstripes. Universal hardware fits most popular air and electric tools. Also works on waterborne finishes. Can be used on fiberglass surfaces (slower speed). Approximate usage - 5-6 medium size vehicles with 5/16" wide pinstripe - 144 lineal feet. *Older finishes may need to be polished/buffed in affected area of removal due to natural aging process of paints.